← What kind of tweeter are you? Whisky Battle of the Sub-Jacksons. Alright, we’re all not driving Ferraris and eating at Shanghai Shanghai every day. Some of us punters have to grab a value whisky now and then. Usually, my bottom line is Teachers, which at a 45% malt blend is a pretty solid pick. But that’s more than a double-deucer here in Oregon ($22). More on that battle later. This entry is a test of what sub-$20 whiskies will leave you wanting more, vs. going for the Altoids to clean the horrid burnt-rubber taste out of your mouth (I’m looking at you, Old Smuggler). What I am expecting is drinkable blends one could enjoy in a mix that doesn’t overwhelm. I don’t mix cola with scotch, for example, but I might do soda. There has to be some taste to the scotch, else why not use rum, it’s cheaper still. So, these have to have something going for them. I also expect there to be an inverse relationship between advertising budget and taste. Why? At these prices, they can’t have their cake and eat it too. Either their cost basis is in Sportsman Afield adverts or in the bottle. What I was hoping for was to find that these could be contenders for a sip neat now and then. Who knows, we might get lucky. This is an interesting bunch. We have a big name, which comes with the biggest price (and biggest advertising budget), a whisky I’d never heard of until I started researching Monkey Shoulder, and another I’ve never seen even on the web. It’s a dark horse, for sure. At $19.95 out the door, this is the wallet-stretcher of the group. Cutty Sark Blended Scotch Whisky adverts itself as “the original easy-drinking scotch whisky.” That does not bode well. Furthermore, the lads at Edrington, who also market The Macallan and Highland Park, two excellent single malts, do a fair bit of advertising for this marque. 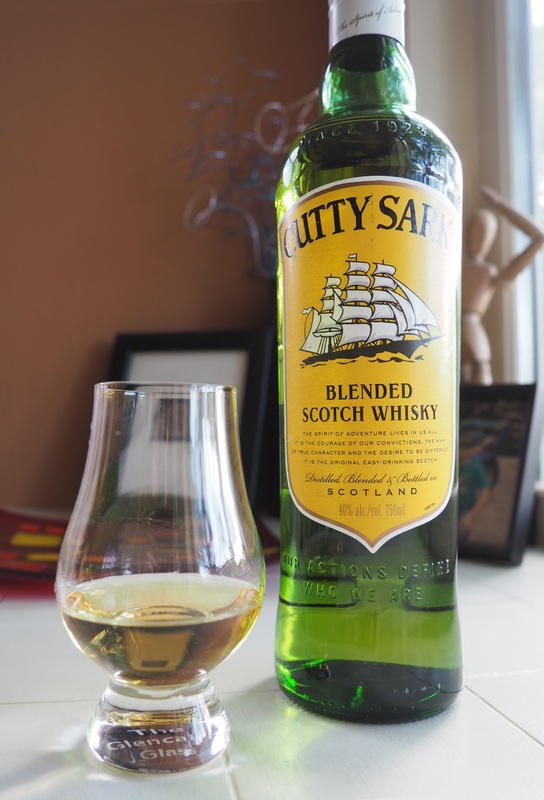 I’ve been aware of Cutty Sark since I was just a kid. Perhaps my Dad drank it. I don’t know, he died before I got to know his drinking habits too well but seeing as how our family was not known for top-shelf drinks, it’s likely. But for certain I saw this alongside adverts for Dewars and Black and White in many manly sporting magazines I read when I was young. That was ages ago and those magazines are shades of their former selves, but you still see Cutty on billboards. So, what do you get for your Jackson? Well, not a hell of a lot, unless you like sweet bilgewater. Nose: A slight sting of alcohol if you get too deep in your Glencairn. A bit of oak and malt, a slight tough of citrus oil, but overlaying it all is some musty seaweed, even bilgewater. An acquired taste. Palate: White-sugar sweetness, and mid-palate a hint of orange-soda. There is some oakey tannin holding up the mid-palate. Finish: A touch of oak, more of that white sugar sweetness, and lingering yuck reminiscent of the nose; not much else. Maybe a bad batch — we don’t buy it enough to know (had a bottle around a year ago which passed without comment). Bottom line: There are better blends even for mixing. Man, these guys make Highland Park?! This dramatic shot is more attention than the importers give the label. 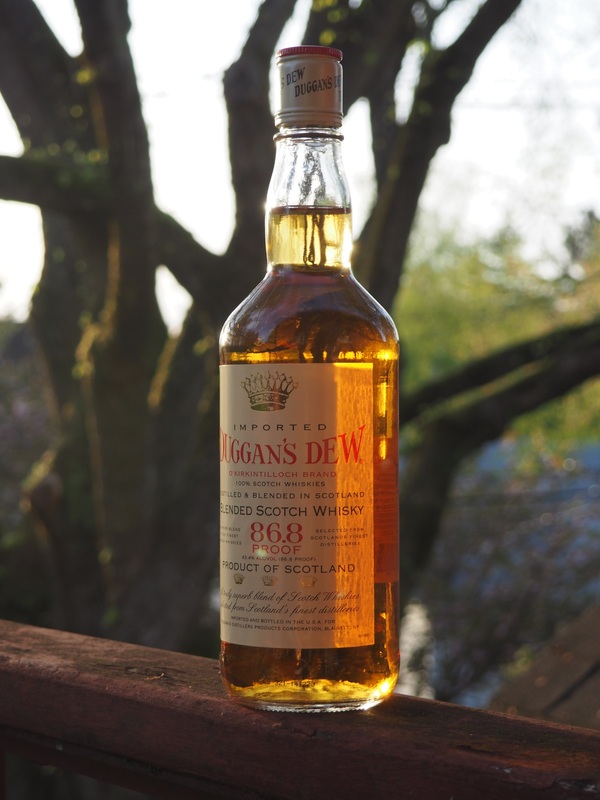 I gotta be honest here: the most notable thing about Duggans is it’s price: about $15 here in Oregon. And it’s 43.4% ABV, so wow, this is quite a deal if you need to quiet some brain cells at the end of a hectic day. There really isn’t much more to know about it. The label says ‘Imported’ — always a bad sign. Hell, even Old Smuggler is imported. So is bird flu. On the web I can find no more than their importer’s web site, and they don’t even ask your birthdate to visit. They don’t advertise and they spend next to nothing on their web presence, so what goes into the bottle? Nose: a surprising touch of earth, so some peaty water was used at some point. I get some toffee and malt. Palate: Very sweet, toffee and caramel. No tannins to balance it out. Finish. Well, it’s $15, you don’t buy much finish with that. Quick and sweet. Bottom line: It’s not offensive, beyond being sweet. Kinda nice it’s got some earthiness. A few bottles have gone through the house (the wife likes it) and they have been consistent. 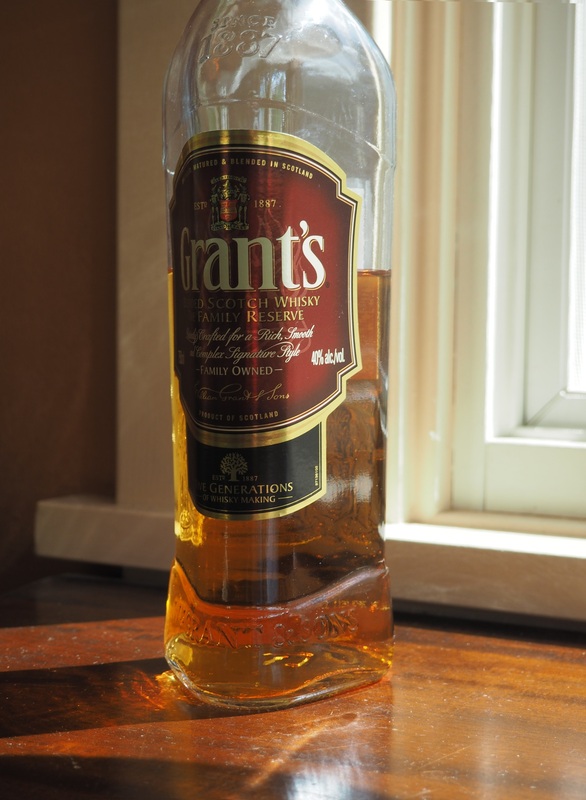 Grant’s Family Reserve, a blend of 25 malt and grain whiskies. Ah yes, Grants. Same bunch (William Grant & Sons Distillers Ltd.) that makes Glenfiddich (which I have tried) and The Balvenie (which I have not). Grant’s Family Reserve have a separate website for the range. Not a very useful website, I might say — just recently while writing up the Monkey Shoulder post, they had all kinds of info there, like about how they blended the Family Reserve — from 25 separate malts. Those helpful pages are gone. An update to the Grant’s web site has replaced all the helpful info with marketing fluff. Marketing, bane of the 21st century. But for Grants Family, there are not many (if any) print ads, and I’ve never seen it on a billboard. I have high hopes they put the money they don’t spend on website updates is used to improve what goes into the bottle. But we are here to taste, not to moan about the decimation of useful websites by the marketing department. At $18.95, we’ve got us a real sub-Jackson, though near the top of the range. We expect more from this than either the budget-priced Duggan’s or the heavily-promoted Cutty. Nose: A noted earthy scent, pleasant, and mineral. There is the barest touch of a floral note (rose?) and a very faint whiff of smoke. Definitely the most intriguing nose of the three. Palate: Not as sweet as the two other contenders. and it has some structure and balance from oak and malt notes. There is sweetness and the floral from the nose is a bit strawberry soda on the mid-tongue. Finish: On the sweet side, but not nearly as pronounced as Duggan’s or Cutty. There is a touch of oak but not enough to balance it. Bottom Line: If you are looking for the best-tasting sub-Jackson, this is a likely contender. Not as structured or rewarding as the double-deuces but hey, for 19 dollars (here in Oregon), not bad for a soda mixer. It’s their finest. But there’s the 12, 17 and 21. Are they worse?! I’m at sixes and sevens about the marketing on this one. On one hand, they claim it is their ‘finest’ but they have a 12, a 17 and a 21-year old. Surely those older releases can’t be less fine than the Finest? So that’s a bit weird. On the other hand they describe the taste as “Subtle, sweet and with a vanilla finish” and they are right on the money with that description. Being marketing folks they over-reach a bit and go on to claim a bit more about the ‘prominence’ of floral and citrus — it takes a finer nose than mine to detect those in prominence. Whether you agree that the nose is “soft” and “elegant” depends on your approach to elegance. 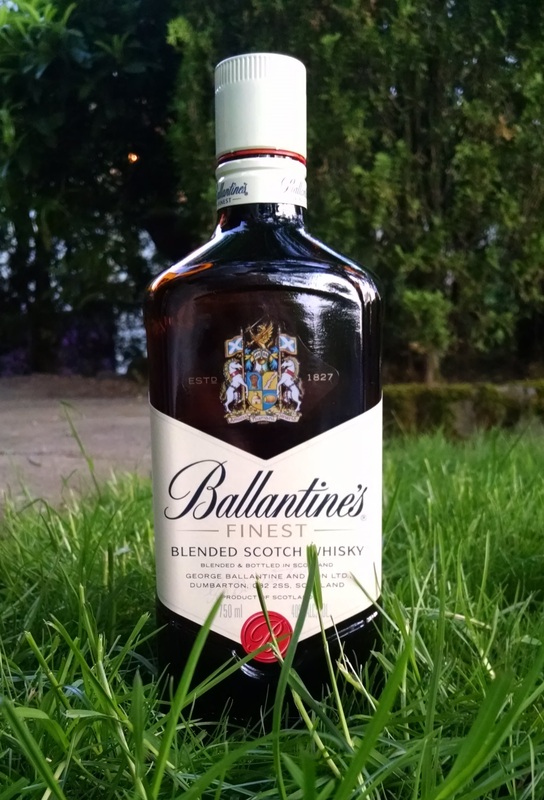 Ballantines I can say is devoid of any off-putting aromas. It’s around the house enough (being the whisky wife’s preferred sub-Jackson nightcap) for me to have encountered a number of bottles, and I’ve never noted anything awry. So, kudos there. It’s good to have dependability in a sub-Jackson. Nose: Not a whole lot going on. A little caramel and honey. Palate: Fairly sweet but not overpowering or as pernicious as the Duggan’s. It has enough structure that you know it has encountered some oak, as is required by law, and the taste is fresh enough that you can be confident the oak was in better shape than what welcome’s Cutty Sark. But less character than the Cutty. A subtle vanilla note rides over the sweetness. Finish: On the sweet side, but not nearly as pronounced as Duggan’s or Cutty. There is a touch of oak but not enough to balance it. A bare whiff of vanilla says a quick good-bye. Bottom Line: A reliable, non-objectionable choice. For mixing you might want a more robust choice. For those who are not into assertive scotches, this will do. So, there you have it. The expectation proved true: less advertising has translated into more value in the bottle for the same price. I’d like to walk up the ladder to the double-dueces next, and test a challenger to the Monkey Shoulder — Black Bottle (in its modern form), but what I’m really looking forward to is comparing some of the price contemporaries to Johnnie Walker’s lines. Those whiskies are very heavily advertised. But they are also pretty damn good. This entry was posted in Scotch-blends, Whisky and tagged Cutty Sark, Grants, Whisky. Bookmark the permalink. 3 Responses to Whisky Battle of the Sub-Jacksons. It’s an interesting topic: best tasting budget whiskies. In Australia, you’re never going to find a bottle of scotch for under $20 due to taxes and such. So the cheaper bottles such as these will be $30-40. My favourite in this range is the Bailey Nichol Jarvie (BNJ). But you’re right, it’s hard to go past the monkey shoulder – though in Australia it usually sits at about $50. Of course, the best value whisky we have ever discovered would have to be this one: http://whiskywaffle.com/2014/10/12/the-greatest-whisky-in-the-world-conditions-apply/ Good. Times. Thanks for dropping by again, Nick. Ah, yes, I see Claymore has attained the sort of heightened state of appreciation which comes only during formative times with those kinds of buds who become lifelong friends. My core buddies and I had a similar appreciation for Anchor Steam beer, the first American beer we had that was actually good!